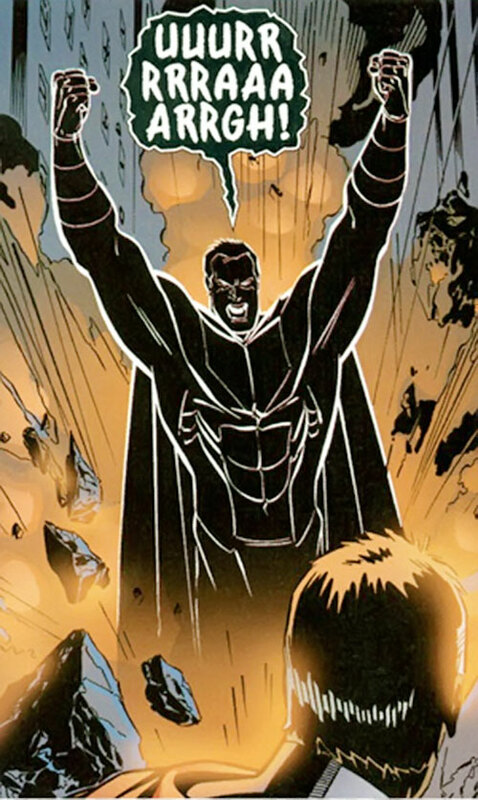 The Shadow Supreme appeared in 1996, in Alan Moore’s Supreme stories. These were an unabashed homage to many aspects of Silver Age tales of Superman, and the Shadow Supreme is thus an “anti-Superman” figure. Its creator, Darius Dax, is a Lex Luthor expy . Known Relatives: Darius Dax (creator). Group Affiliation: None, formerly ally of Darius Dax. Base Of Operations: Mobile, or entrapped in the Hell of Mirrors. Can fly faster than light. Can emit blasts of several sorts of energies. Has several supersenses (represented by his WIL). Its twisted mind, unlike the original’s, is incapable of great scientific feats. It also has a terrible temper. In 1953, rogue scientist Darius Dax built a device called the Negatizer. It was capable of creating a physical and moral negative duplicate of any person or thing. Turning the ray on Supreme, he created the dreadful Shadow Supreme, a monster as cruel and savage as Supreme is kindly and wise. 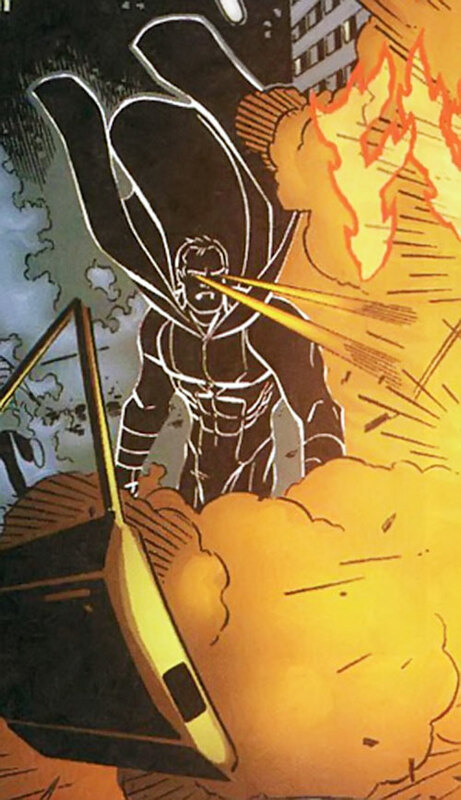 Years ago, Supreme had defeated many of his deadliest foes, including the Shadow Supreme. He imprisoned them behind a barrier of hard light that separated our reality and another. Supreme dubbed it the Hell of Mirrors. Korgo, Optilux, the Shadow Supreme, the End and many others remained trapped there indefinitely. Or at least until the Televillain happened upon a telecommunicator left behind by bumbling Dazzle Comics writer Billy Friday. Under the Televillain’s leadership, the Mirror Menaces escaped after nearly 30 years imprisonment. They first wrought havoc in the Citadel Supreme, then in greater Omegapolis. Accompanied by Suprema, Supreme set out to track down and subdue the Mirror Villains. This was a difficult task under any circumstances, but the presence of the nigh-omnipotent Optilux made it even more daunting. The Shadow Supreme fought and defeated Suprema. He also told her that he had killed her super-powered dog, Radar, although that had only been a robot decoy. Suprema was saved when Supreme intervened. Supreme could only fight the Shadow Supreme to a stand-still, but he succeeded in temporarily imprisoning him at the centre of the Earth’s core. Later, after having freed himself, he went back after Supreme and Suprema. They were unable to defeat him. But the real Radar showed up, enraged, and bit off the Shadow Supreme’s hand in a savage attack. The overpowered Shadow Supreme fled to Washington, where his former Hell of Mirrors inmates Korgo the Space Tyrant and Vor-Em had taken over the office of the President. Before the three could finish off the hounding Radar, Supreme used the propaganda chemical of the newly captured Slaver Ant on Vor-Em and the Shadow Supreme. He then beat each other to unconsciousness. The Shadow Supreme was then returned to the Hell of Mirrors and has not been since then. The Shadow Supreme is an exact copy of Supreme. 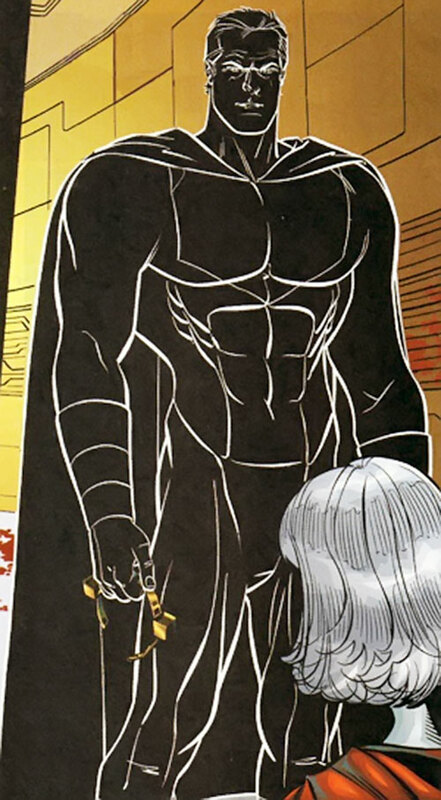 But everything about the Shadow Supreme is colored like a black negative, including its hue and hair. Like the original it is a very muscular and athletic man. Its black supervillain suit covers all but its arms and head. It also wears black boots, a black cape, a black symbol on the chest and on its back and a pair of thick black gloves. The Shadow Supreme looks eerie and evil, as well as powerful and terrifying. The Shadow Supreme is a semi-sapient , non-human powerful force of destruction and nihilism. Its motifs and personality is the exact moral opposite of Supreme’s. As such, it is an evil monster and killer that enjoys destroying everyone that stands in its way. It is as cruel and savage as Supreme is kindly and wise. In its own twisted logic it stands for everything Supreme opposes, and the two are natural enemies. It will join forces with Supreme’s enemies and will fight along other powerhouses intent on destructive themes. It hates Supreme with a passion and refers to him as “the accursed one” or “the hated one”. Supreme knows this fact, and that the Shadow Supreme is a raving, murderous version of himself. And so the Shadow Supreme might be the only enemy that Supreme actually fears. The Shadow Supreme is also a proud being and considers it an honor to deliver the finishing blow to an enemy. It depends upon its knowledge that Supreme would never kill it. It believes Supreme to be too civilized, too humane, while it itself has no such qualms. At times it sprouts intelligent and sophisticated one-liners, but mostly it talks like a thug. It has no patience and, on occasion, expresses fits of murderous rage. Although he can work in groups, people tend to fear him for his murderous behavior and dark personality. Yet he is a friend of Korgo the Space-Tyrant and plans to rule the world by his side. It bears the utmost respect to its creator, Darius Dax, and think him to be God himself. Whenever God’s name is mentioned it tends to rave at and attack the offender – telling them that God, Darius Dax, is dead. The Shadow Supreme is a apparent homage to Silver Age Superman’s more savage superpowered enemies. 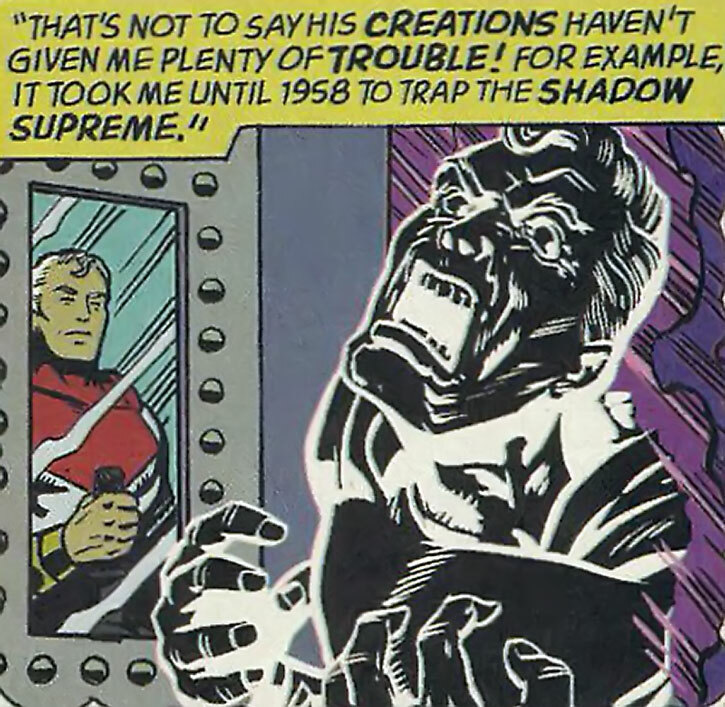 As such, the Shadow Supreme probably takes the spot of the Galactic Golem (as a creation of Darius Dax, Supreme’s Lex Luthor equivalent) or even Solomon Grundy (Bizarro is represented by Emerpus, the reverse Supreme). 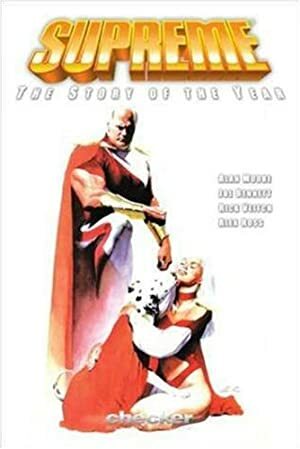 Thus, use either the Silver Age DC Universe in its entirety or Moore’s Supreme Universe, possibly as a parallell world, with its small differences and twists of these classic characters. MIH toward Supreme, Catastrophic Rage, Strange Appearance.